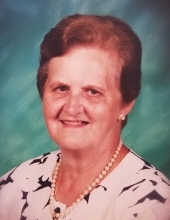 Stella (Stasia) Palermo, 89, of Vandergrift went to be with the Lord Friday, February 8, 2019 with her family by her side. She was born June 21, 1929 and the daughter of the late Stanley and Marianna (Urbanski) Nawrocki. Stella was an amazing woman who loved to cook, bake and especially care for her family. Among many of her special talents she enjoyed bingo, bowling, and being a life member of TOPS. Stella is survived by six daughters; Deborah Vogel of North Apollo, Cindy (James) Baculik of Freeport, Barbara (Jack) Naviglia of New Kensington, Mary Ann (Dan) Shellhammer of Apollo, Patricia (Ricky Kunkle) Palermo of Wyoming, Pamela (Ron) Hawley of Vandergrift, sixteen grandchildren, thirty-seven great grandchildren and eight great-great grandchildren. In addition to her parents she is preceded in death by her husband Arthur Palermo, two sons Samuel and Arthur Palermo, five brothers; John, Frank, Theodore, Joseph, Henry, her sister Mary, and a great granddaughter. Family and Friends will be received on Tuesday, February 12, 2019 from 2:00 to 4:00 pm and 6:00 to 8:00 pm at the Janette L. Gamble Funeral Home Inc. 2842 River Road Vandergrift, Pa (724) 567-7006 and on Wednesday, February 13, 2019 at 11:00 am for Mass at Saint Gertrude Church in Vandergrift with Father Michael Scriberras officiating. Memorial contributions may be made to the Huntsman Cancer Institute of Salt Lake City Utah. Online condolences may be made at Gamblefh.com. To send flowers or a remembrance gift to the family of Stella (Stasia) Palermo, please visit our Tribute Store. Family and Friends will be received on Tuesday, February 12, 2019 from 2:00 pm to 4:00 pm at the Janette L. Gamble Funeral Home Inc. 2842 River Road Vandergrift, Pa (724) 567-7006. Family and Friends will be received on Tuesday, February 12, 2019 from 6:00 pm to 8:00 pm at the Janette L. Gamble Funeral Home Inc. 2842 River Road Vandergrift, Pa (724) 567-7006. Family and Friends will be received on Wednesday, February 13, 2019 at 11:00 am for Mass at Saint Gertrude Church in Vandergrift with Father Michael Scriberras officiating. "Email Address" would like to share the life celebration of Stella (Stasia) Palermo. Click on the "link" to go to share a favorite memory or leave a condolence message for the family.